NASA's space shuttle Columbia blasted off 10 years ago today (Jan. 16) on a mission that turned out to be the last for the orbiter and its seven-astronaut crew. Columbia broke apart upon re-entering Earth's atmosphere on Feb. 1, 2003. The tragic accident destroyed the shuttle, claimed the lives of all seven astronauts aboard and signalled the beginning of the end for NASA's venerable shuttle program, which retired in July 2011 after 30 years of orbital service. "If we hadn't had an accident with Columbia, we would probably still be flying the space shuttle," said Wayne Hale, who served as a flight director for 40 shuttle missions at NASA's Johnson Space Center in Houston before becoming manager of the shuttle program in 2005. Columbia was the first space shuttle to reach orbit, blasting off on the program's maiden mission on April 12, 1981. The orbiter launched 27 more times over the years. 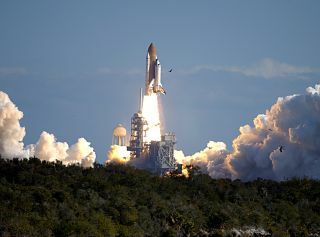 The last one, on Jan. 16, 2003, kicked off Columbia's STS-107 flight, a research mission that carried more than 80 experiments investigating a variety of questions in fields ranging from biology to fluid physics. Tragically, Columbia and her crew — commander Rick Husband, pilot Willie McCool and mission specialists Michael Anderson, Kalpana Chawla, David Brown, Laurel Clark and Ilan Ramon — never made it home. An accident investigation board later concluded that a chunk of foam broke off the shuttle's external tank and struck the leading edge of Columbia's wing during launch, punching a hole in the shuttle's heat shield and leaving it vulnerable to the extreme temperatures experienced during re-entry. The Columbia disaster was the second major tragedy for the shuttle program. The first came on Jan. 28, 1986, when the shuttle Challenger — doomed by the failure of a seal called an O-ring on its right solid rocket booster — disintegrated 73 seconds after blastoff, killing all seven crewmembers aboard. Hale has described both accidents as preventable, the result of human error and a lack of attention to detail. "We thought we were better than we were," he said of the Columbia disaster. "We became overconfident. We thought we had a mature vehicle flying in a well-understood environment, and nothing could have been further from the truth than that." The Columbia accident had far-reaching consequences, and not just for the friends and families of the astronauts who were lost that day. The shuttles were grounded for 2 1/2 years, returning to flight in July 2005 after new heat-shield safety tools and inspection protocols were developed. And the tragedy set in motion the eventual retirement of the shuttle fleet, which was announced in 2004 and became official in 2011. Today, all of NASA's remaining space shuttles — Discovery, Atlantis and Endeavour, as well as the prototype Enterprise — are museum exhibits. The space agency is developing a new capsule-based spacecraft called Orion for deep-space exploration, and plans to rely on new private spacecraft to ferry astronauts into low-Earth orbit for trips to and from the International Space Station. Until those new spacecraft become operational, however, NASA is dependent on Russia to launch crews into space. "President [George W.] Bush at the time decided that we needed to do other things," Hale said. "It changed the whole complex. Not only did the president decide to retire the shuttle, but other perspectives that say we need to do deep-space exploration, or perhaps start commercial space transportation — all of those things came after Columbia."